WaterfallNow employs a similar method used in the production of many sinks, bathtubs, shower walls, and more. We utilize a blend of natural stone powders (to achieve the right pigment or texture for the application). We combine that with synthetic materials such as fiberglass (or fibreglass) to increase the strength multiple times over. WaterfallNow has in the past utilized GFRC on applications for larger commercial projects but the price tag was often far too great for the average home owner. Back in our landscaping days we noticed a large market for home owners who wanted a waterfall in their backyard. Often times we found that they settled on natural rock formations. We were the guys that people called to clean their green coloured ponds. Eventually they just told us to remove the pond and install fresh turf. This led us to believe that there had to be a better way. We have tried all sorts of different methods for creating artificial rocks (believe me). Some of these methods might even remind some people of their grade school days… Think paper and styrofoam. Interestingly enough the styrofoam idea did work for a bit but we required something more scalable. Eventually we turned to a lightweight and more ideal method of creating backyard waterfall features for our clients with fiberglass as the key ingredient. 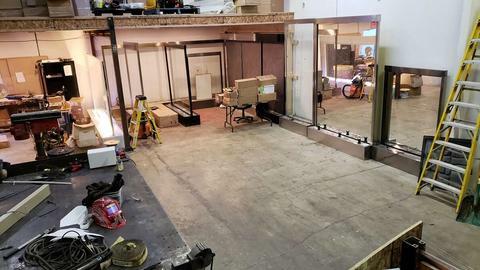 Each renovation project is a blank canvas for us to display our artwork. This is not our video but this is what a GFRC Rock Panel typically looks like. GFRC is much heavier than fiberglass and can be difficult to move once created. Our technique usually requires fiber materials, resins, chemical hardeners, natural stone powders, a mold, and some time. You will see halfway through the video a sample of the rock mixture. This is the method WaterfallNow previously employed. 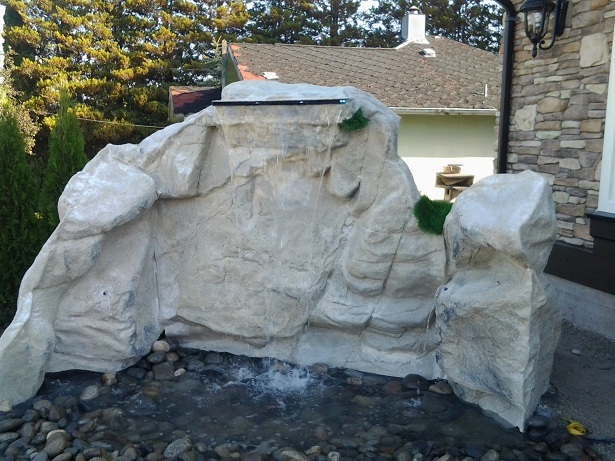 Though the market for rock waterfalls is not yet as big in BC as in the US we know that overtime (just like our experience with artificial turf) we will create it. Moreover, we are positioning ourselves this year to make it a growing trend in Surrey. We look forward to partnering with others in the water features industry that are looking to spur this change in garden renovations. Because our main market is for homeowners we had to find a different way that would offer more customization with half the cost to the client. We employ a method that is light enough to be cut or bent, strong enough to withstand natural elements, and looks better than the real thing. Perhaps in the future we will again employ GFRC if we get a request but it is no longer our focus. There are many different variations for creating artificial rock panels and a wide variety of materials that can be used. In the end it all depends on what the client wants and exceeding their expectations to provide many great experiences. Once you create some rock panels and begin putting them together, the possibilities are endless. This could potentially be a DIY project (at least half of the process). Once the surrounding landscape is complete with plants, grass, trees, and lighting, this water feature will look very nice. Can be remote operated, moved to another location, and even painted to a different colour.